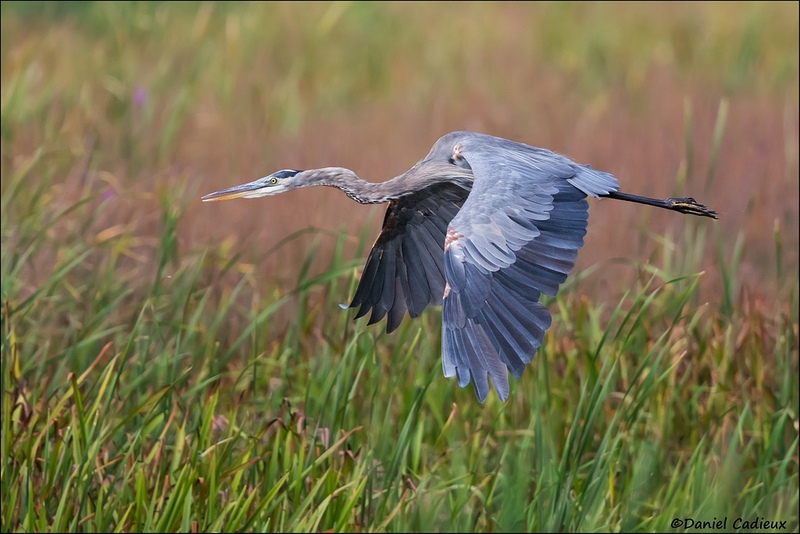 A Great Blue Heron suddenly appears from your right, flying at eye level right above beautiful marsh habitat, and crosses in front of you perfectly parallel to the camera. You fire off a series of 12 images, each one being sharp, well exposed, and needing but a slight crop to help the composition. For many that can bring on an unexpected predicament: which one(s) to post-process? One option is to keep and process them all, but that is rather redundant IMO. Better, cull them and keep the best half. But again, which ones to keep? Best, cull them all but the very best one, or perhaps a second one too. Better than the full “pancake” wing position (wings spread flat, like a small airplane), which is the worst IMO. Still not quite to my liking though. Had this been a rare bird for me, or a personal first ever sighting of this species, and this was the only image I had managed of it, then I’d keep this frame. Otherwise, it’s a “delete” for me. A few extra grasses crossing the head and neck also help me in making this one bound for the trash can. The heron is perfectly sharp, and nicely parallel to the back of the camera. But the wings are bent at the joint. It is an awkward position to me. Yes, that is a natural bend but artistically this just does not speak to me. Some may like it, but for me this is a bad wing position, especially when you have others to choose from. Instant delete for me. This one is the same vain as image #1, and another that I would only keep only in those same conditions. OK, but not ideal. Had the wings been extended fully up, my second favorite position, then I would have kept it no matter if there was a better wing position or not in the series. 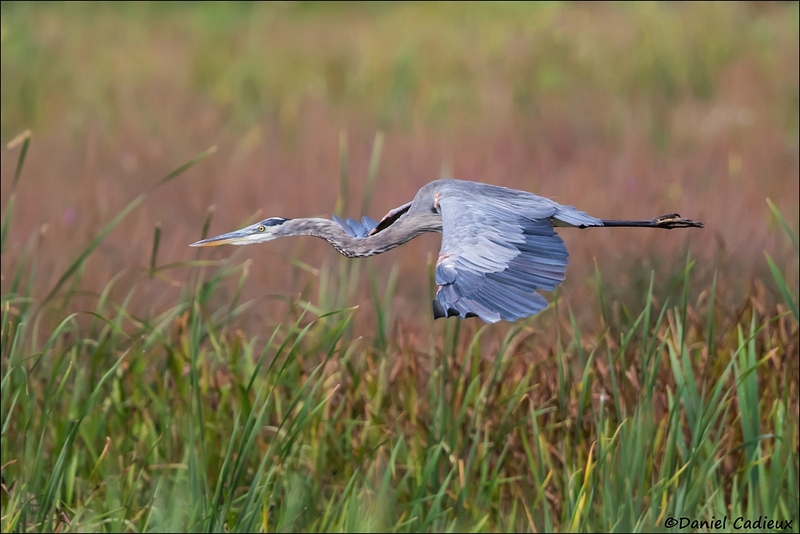 I wish I had a “full up stroke” in this series, but the heron was not in full power-flight and thus never extended its wings up so high. The background is better here and less distracting around the face area. Still, this is a “delete” for me in this particular case. Ahh, now we’re talking! 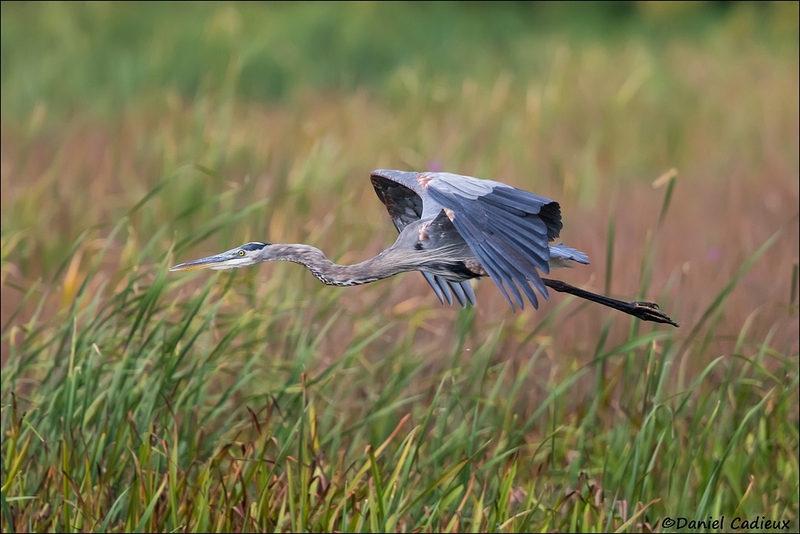 Hands down my favorite wing position for a bird flying relatively parallel to the back of the camera, beating only the full up stroke. This beautifully shows the full thickness of the wings. We can clearly see all primaries, secondaries, and tertials. The textures, patterns and colour variations are better defined. 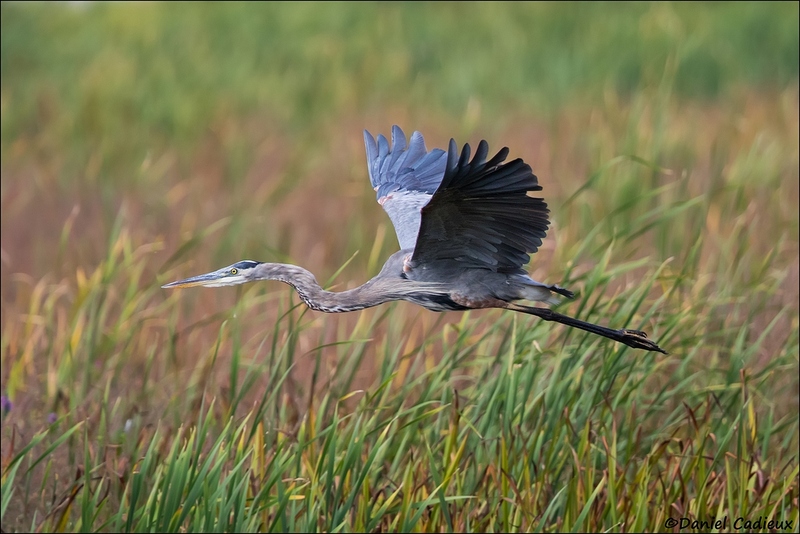 We get a full sense of the power of flight, making the image a much more dynamic one. As an added bonus, the face is clear of distracting grasses, and the bill is slightly open, adding yet another point of interest. So that is my reasoning in culling images in a series. 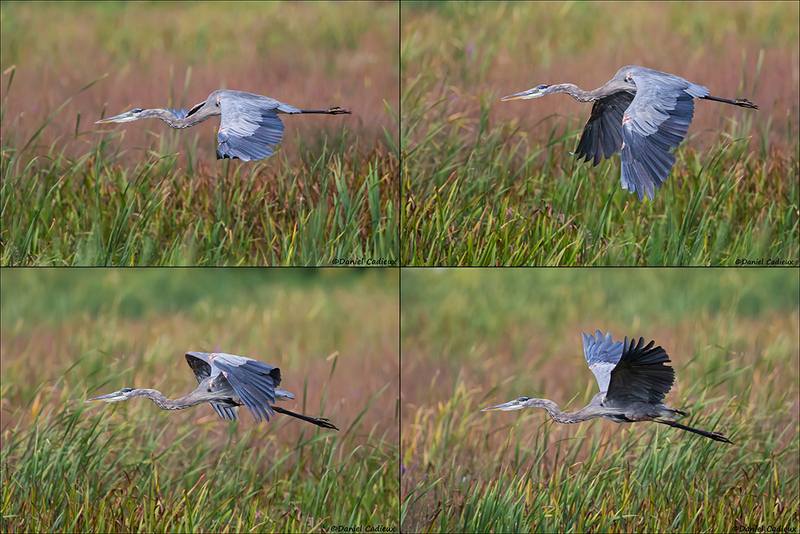 Choosing to keep only one, maybe two, of the best in a sequence of flight images. Do you agree, or not? Which one do you like best? Agree 100%. The full downward wing extension is the highligh, and the lack of background detail behind the head and neck makes that area stand out. Hey Daniel, from the moment I saw the initial composite image my eyes settled upon the wings downward pose. It all came together with the lack of distracting elements around the head/neck area as well as the open mouth. A cracker of a shot most definitely! Thanks for chiming in Faraaz. Glad you like it! Beauty is in the eye of the beholder…. #4 is the Best position in my eyes that many would love! #2 holds great interest with wing shape, legs & beak draw Me right into this very natural life scene. Artistically #2 draws me with the warm muted colours to the right and sharper brilliance left as this magnificent full action Heron heads off to brighter adventures ☺. Good luck in your decision Dan. Hi Bonnie, thank you for your thoughts, and your reasoning behind image number 2. That’s what makes art great! without doubt the best picked straight away before reading the article fully. Hi Daniel, #4 is my fave for sure. I can’t stand it when I’m stuck with flat wing poses on BIF. Nice post. Yep, flat wing poses go to the trash bin! Thanks Allen. Couldn’t agree with you more. Beautiful photo! Hi Daniel, I recently purchased the 7D Mark II and was wondering what focusing mode do you like to use ? Hi Terry, I use AI Servo, continuous. Single point most of the time, sometimes with expansion points. I do move the point around for the composition when I can, but I keep it in the centre for flight.